Tokyo – July 4, 2018: Mitsubishi Motors Corporation is to introduce a new design for the interior and exterior of approximately 5,000 dealer stores worldwide. 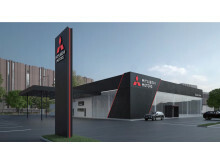 The move is based on the new brand message "Drive your Ambition", announced last year, and is intended to provide a better customer experience in a high quality retail environment and to strengthen Mitsubishi Motors' brand image. The striking new design features black, white and gray color schemes with red dynamic lines as an accent. The uniform design will also ensure a coherent experience for customers across all points they touch the brand, from motor shows, websites and brochures to the dealership. The architecture reflects the new Corporate and Visual Identity, with a "Dynamic Slope" as a signature element to present the robust and dynamic image of the brand. 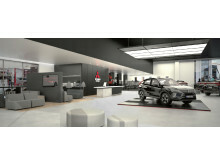 Inside, the showroom is designed to provide a better customer experience, while the cars are presented to make sure they're seen as the stars. Guillaume Cartier, Senior Vice President of Global Marketing & Sales Division at Mitsubishi Motors said, "Our brand is evolving and we need to reflect this in each and every customer touch point. So we are implementing the new dealer identity to ensure that the customers can experience a consistent Mitsubishi-ness including look & feel, and service quality of Mitsubishi Motors wherever they are in the world."